This spectacular Crater Lake lodging is located just 28 miles from Crater Lake National Park (Oregon's O NLY National Park) and 1/4 mile from the Rogue River, offering warm and inviting accommodations in the natural beauty of Oregon . If you are interested in a Crater Lake Bed and Breakfast or Crater Lake B&B, Crater Lake Hotel, a Crater Lake Motel or a Crater Lake Restaurant this is the place to visit. The hotel, at one time a Stage Coach stop, now is run as a Bed and Breakfast Inn, was built in the late 1880s and is listed in the National Register of Historic Places, is a magnificent stage house with grounds that are great for strolling or just relaxing after a long day's hike. It is the only Historic Hotel Bed and Breakfast Inn, modern Motel and Dinner House restaurant in close proximity to Crater Lake National Park. Less than 45 minutes from the Crater Lake Rim and within 40 miles of numerous natural points of interest, the hotel was a stop for Stage Coaches and has housed noted dignitaries that came here for Crater Lake Oregon lodging such as Theodore Roosevelt, Zane Grey, Jack London and William Jennings Bryan. The historic hotel has been totally restored, from the ten rooms in the main house to the fourteen motel units, some with kitchenettes. The Hotel's Dinner House restaurant has been written up in Sunset magazine as "the best Dinner House between Medford and Crater Lake " and is open May through October, most holidays, and for prearranged groups. We are recognized as the place to eat for Crater Lake dining. Our modern motel is on the same property and is family and pet friendly! A wheelchair accessible room is available in the motel, please ask when making reservations. Or Call Now to make reservations for Crater Lake Lodging toll-free 1-800-944-6490; in Oregon call (541) 560-3664 or fax (541) 560-3825. Room prices $80-$295. 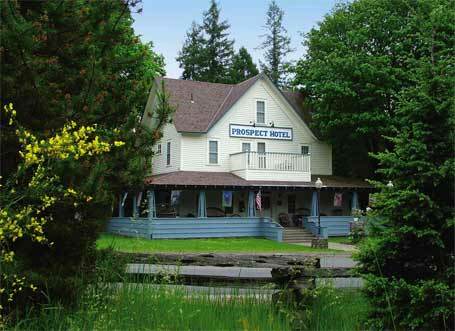 Written reservations may be mailed to Prospect Historic Hotel, P.O. Box 50, 391 Mill Creek Dr. , Prospect OR 97536. Mastercard, Visa and Discover are accepted. The Dinner House may also be reserved for weddings, parties, meetings and other events. Information on this website was deemed accurate at the time of posting; however for the most current information please contact the hotel directly. is available almost everywhere at no charge!